Why conduct root cause analysis? A root cause analysis helps to identify the challenges a program should address to reach its vision. SBCC strategies that only address the obvious or most visible aspects of a problem are not likely to succeed. For example, a family planning campaign that only raises women’s knowledge of contraceptives will likely not result in increased family planning use if husbands or mothers-in-law are the primary decision makers regarding family planning use. Identifying the sources – the root causes – of a health problem helps programs develop a more effective strategy to overcome it. Who should conduct a root cause analysis? A small, focused team should conduct the root cause analysis. Members should include communication staff, health/social service staff and, if available, research staff. Typically, the same team conducting the situation analysis will also conduct the root cause analysis. When should a root cause analysis be conducted? A root cause analysis (or other forms of problem analysis listed in the resource section of this guide) should be conducted as part of the situation analysis. It can take place as part of a stakeholder workshop or, if needed, during additional discussions with stakeholders or audiences. The steps below will help identify many possible causal factors including the root cause of the health issue identified during the situation analysis. Completing a root cause analysis can take up to several hours. Consider how much data is available, how well the data identifies causes and whether additional stakeholder or audience input is needed. Know the difference between causal factors and the root cause of a problem. Identify causal factors of a public health problem. Identify root causes of a public health problem (these will be both program and communication challenges). Identify and rank communication challenges. During the situation analysis, the project team set the vision, identified the problem and collected data needed to better understand the current situation. The team can use that information to identify causal factors – things that cause or contribute to the health problem. To find root causes— the primary sources of the health problem —start with the causal factors identified above and ask why, such as “Why are couples not using modern contraceptive methods?” Root causes are seldom found in the most obvious causes. It is important to dig deeper and continue to ask “why?” until nearly all responses have been exhausted or roots that seem important to address are reached. There are several useful methods for identifying root causes. This process requires good judgment and might involve trial and error. For example, if the team decides to address an identified root cause and the problem continues to occur, that is a good indication it is not the root cause. Take another look at the identified root causes and keep digging deeper to go beyond the symptoms of the problem. Staff can also consult stakeholders and audience members to assess whether they have identified appropriate root causes. Note: Removing a causal factor might improve the situation, but it will not necessarily keep the problem from occurring. This is one way to distinguish a causal factor from a root cause. 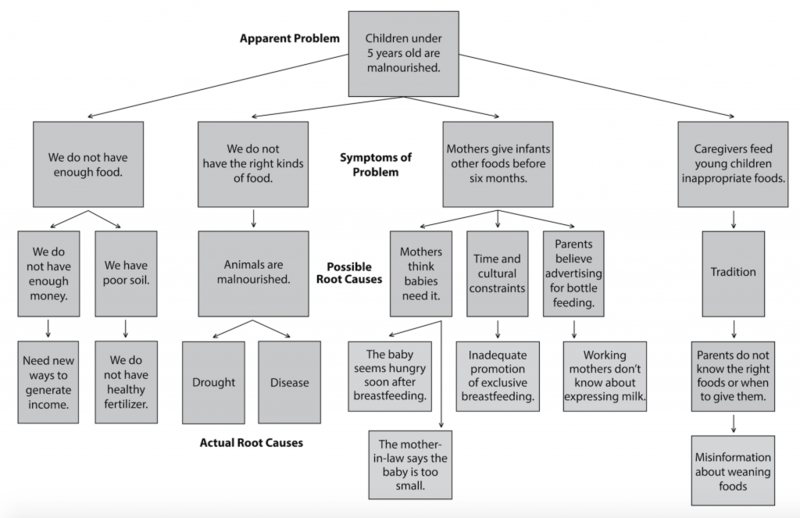 Fishbone diagrams and 5 Whys are other methods for identifying problem sources and communication challenges (see the resources section below for examples). Understanding Operational Barriers to Family Planning Services in Conflict-affected Countries: Experiences from Sierra Leone. U.S. Agency for International Development, Health Policy Initiative Sonneveldt, Emily; Shaver, Theresa; Bhuyan, Anita. USAID. 2007. Now ask which root causes are challenges that health communication can and should address – communication challenges – and which are not. The example below identifies the communication challenges. Share findings about other root causes with local authorities and leaders or organizations that might be able to address them. The desire to give babies additional food too soon. The prioritization of bottle feeding over breastfeeding. The potential impact of addressing the communication challenge. The greater the potential impact, the more important it is to address. How difficult it will be to reach the audience associated with the communication challenge. The mandate attached to the funding. Other resources available to address the communication challenge. There may be other partners working on that communication challenge or additional funding streams available. Whether there is a logical order in which to address the communication challenges. It may make more sense to address negative provider attitudes before generating demand for provider services. If more than one causal factor is linked to the root cause. 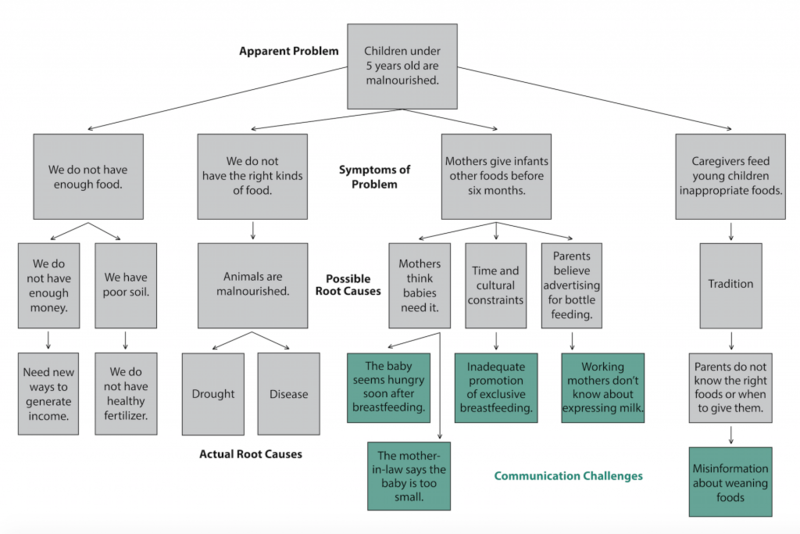 When a root cause is the source of multiple causal factors, it indicates that addressing the root cause can have far-reaching effects. The extreme and long-lasting benefits of exclusive breastfeeding for the first six months. The relative ease of reaching new mothers. The possibility that getting caregivers focused on the right food early (breast milk) will make it easier to focus them on the right foods as the child ages (i.e. nutritious and easy-to-digest weaning foods). Include the prioritized list of communication challenges in the situation analysis to help the creative team focus its efforts. This will help determine what direction the project must take and the kinds of messages, materials and activities to develop. Identify a root cause that is within the team’s sphere of influence. Stop asking why once the team has identified a root cause that is within their collective ability to control or influence. If any cause accounts for more than 70 percent of the causal factors, it can often be considered the root cause. A causal factor is something that contributes to a problem, but is not a root cause. A communication challenge is a root cause that communication can address. A root cause is something [a source] that, if removed, will eliminate the problem.